Posted by Toy Lady in Musings, random stuff. And here we are, actually past Labor Day already! It seems like just yesterday, we were celebrating Memorial Day, doesn’t it? Surly Boy unfortunately didn’t make it home for the long weekend – his car landed in the shop, and it wasn’t done in time for him to drive home for the long weekend, so . . . all that cooking I did last week? Maybe not for naught, exactly, but, well, I had hoped to send my little boy home with a freezer full of good, healthy mom-food, and instead, I’ve managed to ridiculously over-fill my own freezer. Fortunately, he’s going to be traveling through Rochester next month for a concert in Ohio – I think Cleveland. Cleveland rocks, you know, even if it is snot rock. 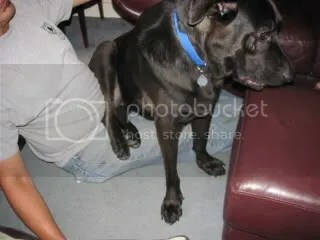 So yes, we’ve had a busy weekend – and lest he feel left out, the dog felt the need to sit in his Papa’s lap for a little while. 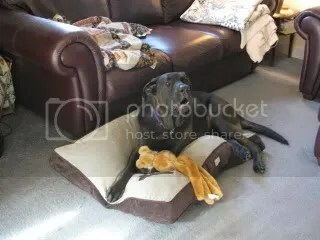 Yes, he is getting a little big for that, but, like the old joke goes – where does a 105-pound dog sit? Anywhere he wants to . . . heh. So, speaking of the dog. 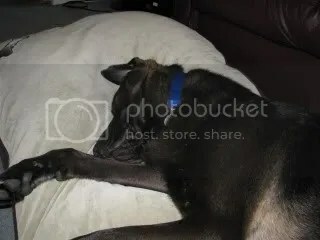 We were invited (actually, HE was invited) to participate in a study with regard to canine osteoarthritis – and his hip dysplasia makes him eminently qualified for this study. So we took our baby in for the initial screening – which included x-rays. 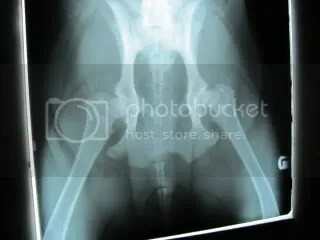 If you look very closely, you’ll see that ball-and-socket joint of his hips include very little “socket” – and, at less than 3 years old, his “ball” is already starting to deform. No wonder he walks funny, huh? And part of the initial screening for the veterinary study was, erm, samples. While the vet’s office was responsible for x-rays and blood tests, we had to provide, um, other, more, uh, icky samples. 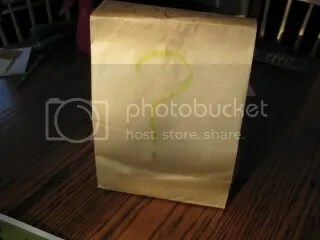 Since we had samples from, well, both ends (so to speak), the better part of discretion seemed to me to be a brown bag. A very special brown bag. Speaking of Bags of Crap. Peeps scored on Woot the other day and got their “bag of crap.” Boy, did he score. 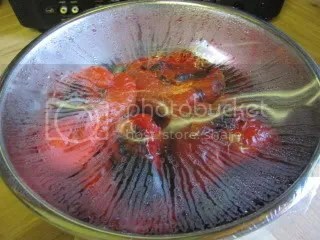 . .
One of the items I made and froze on my vacation was some lovely, lovely ratatouille. 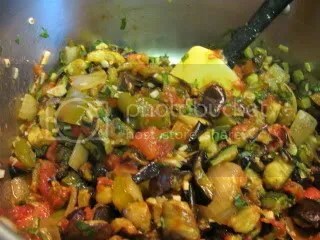 I love ratatouille, and I especially love it in the winter, when it’s less in season. This may just have been my best batch yet – lovely roasted eggplant and zucchini, garden fresh tomatoes and herbs, plenty of peppers, onions and garlic – yeah, this’ll be good in a month or so, too. I do love eggplant. Too bad Surly Boy missed out. 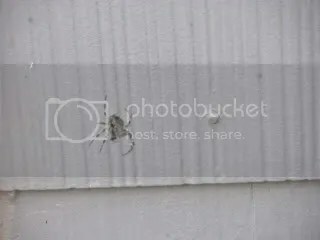 We have a freakishly huge spider living on our deck. I don’t know what her deal is – whether she’s just guarding the compost bucket, or maybe she’s waiting for her chance to invade the house – I don’t know. But she’s gi-normous – probably the size of a quarter, when she’s all curled up. That’s just . . . creepy. And once again, it’s time for the weekly menu plan. Yes, we’re a day late, but we still have to eat every day! And now, it seems, fall has truly come – where last week, the temperatures were in the 90s, this week, we’ll be struggling to see 80. September is just weird like that, isn’t it? Monday – It’s Labor Day, and we’re grilling, yes, but not the typical hot dogs and burgers – I picked up some boneless short ribs, and we’re enjoying some Korean BBQ – along with some basmati rice and tossed salad. Tuesday – Do you remember last fall when Peeps smoked a few pork chops and stuck them in the freezer? I didn’t either until I found them in the freezer – those, along with some fresh green beans and corn will make make a delightful dinner! 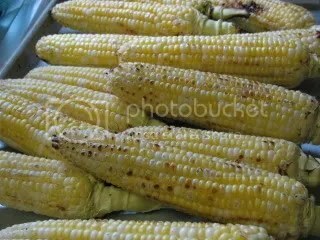 And yes, corn counts as a starch! Wednesday – We’ve got puppy swim class, so it’s a simple matter of reheating some pea soup – we didn’t get to make it last week, but it’s done and in the fridge now. We just need to make some biscuits to go with it. OK.
Thursday – The weather is forecast to be more conducive to grilling, so grill we shall – we’re still trying to find the perfect burger rolls, and everyone knows the only way to do that is to grill burgers . . . along with some salad and fries, of course. Friday – Again, it’s pizza night. I’ll be enjoying some garden fresh tomatoes and fresh herbs, along with as much cheese as is necessary to hold the two together. I do love pizza night. 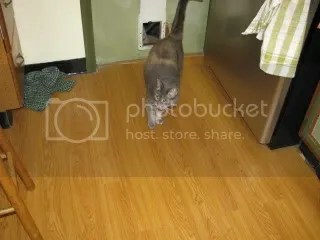 . .
Posted by Toy Lady in Cooking, Cooking Series, Food, Freezer Meals, Garden. Ah, summer, when everything’s in season, and you can’t eat it all at once! If you’ve been a reader here for any amount of time (a week or more, anyway), you’ll know that around here, we’re all about puttin’ up stuff – whether it’s a big old pan of lasagna, trying our hand at pectin-free apricot preserves, making our own mayonnaise, or even curing our own bacon – in most cases, it’s tastier, healthier, cheaper, and often, not all that difficult, to make it yourself – whatever “it” may be. 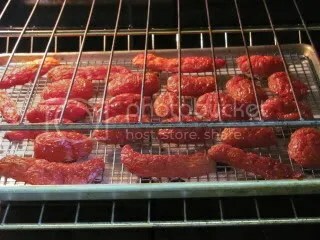 Earlier this week, we dried a whole oven full of tomatoes – we haven’t had to buy those lame store-bought sun-dried tomatoes in years! 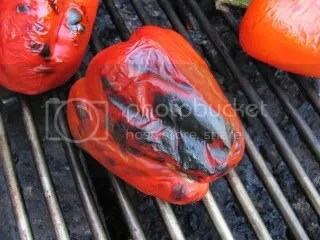 So how about roasted red peppers? Have you priced those lately? I sure haven’t. And guess why not – go ahead, guess. OK, you got it – I buy them in season and roast them myself. Piece of cake. So you start with your peppers, and go ahead and wash them if you want. I’m going to be honest here – unless they’re visibly dirty, I usually just give them a quick wipe. We’re going to be peeling the skin off of them anyway. 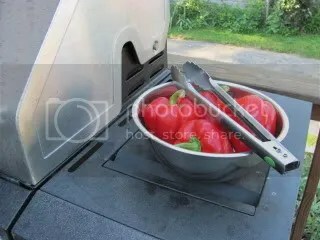 Now I’ve seen directions for roasted peppers that tell you to take a single pepper, hold it in a pair of tongs, roast it over the burner on your gas stove. I mean, I guess that’s OK if you have one pepper – and the patience of a saint. Me – not so much. First, if I’m going to go to the trouble of roasting one pepper, I may as well roast several. You know, in for a penny, in for a pound. In other words, if it’s worth doing, it’s worth overdoing. So anyway, we’ve got 4 (or 6) red peppers, and we’re not about to hold them, one by one, over the kitchen stove. 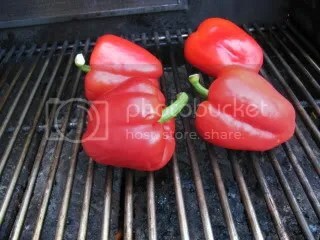 If only there was something that had an open flame we could use for roasting these peppers. Something, maybe, with a grate for setting things on over that open flame. So I’m sure you’ve figured it out already – I fired up the gas grill and just stuck all the peppers on the grate. Let them cook over a high flame until they’re somewhat scorched – the charring ultimately makes them easier to peel. Once you deem the peppers sufficiently blackened, just pull them off the grill and transfer to a steel bowl (remembering, of course, to shut the gas off), then cover with plastic wrap. I’ve heard of people putting the peppers in a paper bag at this point, but I’ve never done that so couldn’t say how it works. But I’m pretty sure, as the peppers cool, you wouldn’t get the neat-o shrink-wrap effect in a paper bag. Simple things amuse me. What can I say? So. After about an hour of cooling while you’re doing something else, your peppers will be ready to seed and peel them – and truly, nothing could be simpler! 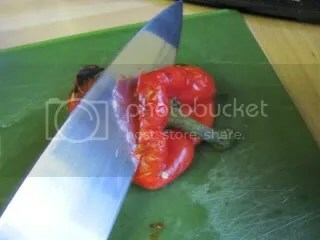 Start by cutting the top of the pepper off – you want to get rid of the stem. The skin on the very top won’t have gotten as charred as the rest of the pepper, so it will be difficult, at best, to peel off, anyway. Remove the seeds and membranes from the inside, then flip the pepper over and peel the charred skin from the outside. 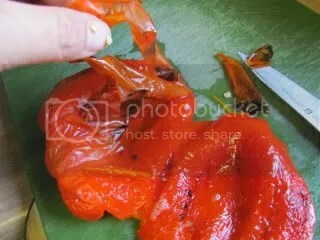 Assuming your peppers are well-charred, you shouldn’t need anything but your own fingers to, basically, just rub the skin off. If there’s a stubborn bit that wants to stick, it can just be scraped off with a paring knife. 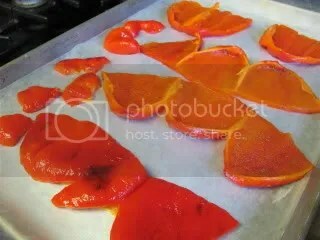 And once the peppers are skinned and cleaned, I like to lay them flat on a lined sheet pan, set it in the freezer until they’re frozen solid, then slice them and pack them into a gallon freezer bag. And there you go – a few minutes of active time (maybe 10 at the grill and another 10 to clean and peel the peppers) and a buck – and now I’ve got all the “fire-roasted” red peppers I could possibly need for those winter pasta dishes! 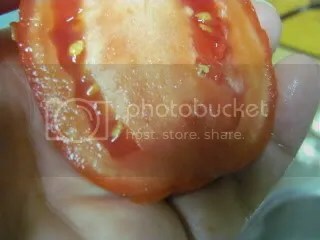 Posted by Toy Lady in Cooking Series, Food, Garden. While I’ve been bemoaning the eventual demise of our gorgeous summer, I’ve also been planning ahead. Oh yes I have, because, really, that’s one of my best things. Remember the grasshopper and the ant? And how the grasshopper spent the whole summer at the beach, drinking margaritas and partying all night, but the ant worked in the garden and got a new roof and, in general, prepared for winter? Well, once winter comes, what do you suppose that old grasshopper is going to do for sun-dried tomatoes? I’ll tell you what she’s going to do. She’s probably going to go to her local supermarket or even Amazon and spend ridiculous amounts of money for a couple of ounces of the silly things. Yeah, and what do you think the wise old ant is going to do? Me, I’m more an ant than a grasshopper – that partying all night? I’m far too old and tired for that anymore. Give me a nice home in the suburbs, a garden, and some zip-loc bags, and I’ll party all I need to, thank you. 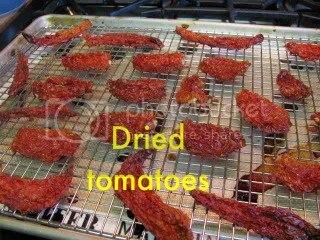 So I’m going to tell you what you need to know about “sun” dried tomatoes. And you don’t need any fancy equipment like a food dehydrator. Nope, what you need is your oven, a sheet pan, and a wire rack. That’s it. And, of course, an understanding of tomatoes. See, here’s the thing. 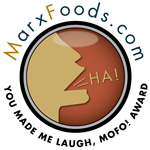 Tomatoes are mostly water. Water is not really conducive to dried food – the idea behind drying is to remove the water and retain the, well, the other stuff. 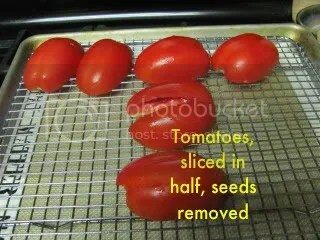 Lay the tomatoes – cut side down – on a wire rack set over a sheet pan. I like to line the sheet pan with a silicone mat (or parchment, or even foil) because, well, no matter how hard you try, you’re never going to get all the liquid out of the tomatoes, and it WILL drip onto the pan. Silicone is easier to clean than stainless. Let me share a lesson I learned last summer. 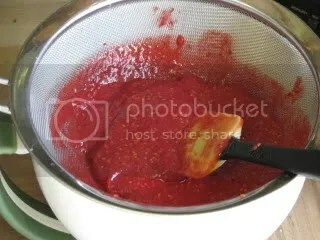 All those seeds and that liquid that you’re scraping out of the tomatoes? You do NOT want to compost it. I mean, sure, it seems like it’s exactly what the composter was made for, doesn’t it? You don’t want to go there, do you? I thought not. So take your tomatoes and lay them out flat on a wire rack (and if you’re clever, which I know you are, you will have sprayed the rack with non-stick spray first because, really, why not? 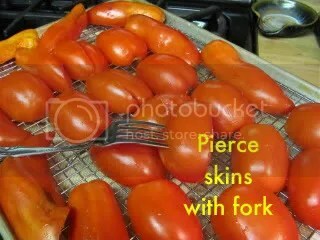 ), and pierce them each several times with a fork. Yes, those are all my tomatoes. Actually, they’re not all OF my tomatoes – they were actually about half of my tomatoes at that moment. But they all came from the garden. So we just pop them in a low (super low) oven – I go with 225° because honestly? If I went any lower, we’d be here all week. I’ve evidently got some juicy tomatoes. They need a little extra, um, incentive to dry, I guess. 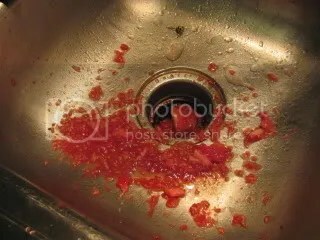 Did I mention that all this tomato cleaning usually goes on directly after I get home from walking the dog? 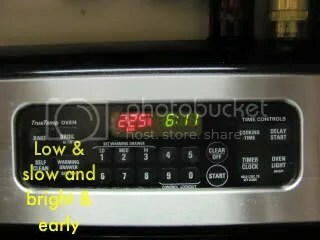 Yeah, I try to get them in the oven by 6 – then I go upstairs and get ready for work. Oh yeah. I leave the oven on when I go to work. And Peeps gets home several hours later (around noon-ish) and he finds a note asking him to check the tomatoes. You can see, at noon they were still pretty puffy, weren’t they? That’s not quite what we’re going for, so he just left them in the oven. By the time I got home from work (3:30-ish), the tomatoes have been in the oven for close to 10 hours, and they’re fairly dry, though not crispy – just what we want! I shut the oven off and just let the residual heat finish the job – in other words, we had puppy swim at 4 and didn’t have time to take care of them, and we didn’t want to leave them in a hot oven for yet another couple of hours. Once the tomatoes are dried to your satisfaction, pull them from the oven, let them finish cooling, then just bag ’em up, pop them in the freezer, and wait for winter – when you can go to the supermarket and scoff at the little tiny bags of sun-dried tomatoes, secure in the knowledge that what you’ve got in your freezer is far superior to anything you’re going to find in a pouch in the produce department. 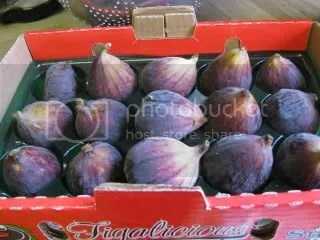 Posted by Toy Lady in Food, Food & Wine, Garden, Musings, random stuff. First thing – if you haven’t entered our giveaway, be sure to skip on over there and leave a comment for a chance to win the drawing for a $40.00 gift certificate from CSN Stores! We’ll be firing up the Random Number Generator Tuesday at 5PM Eastern time, and we’ll announce the winner next Wednesday, so be sure to get your entry in! Remember how, back about a month ago, I was too old for that picking strawberries foolishness? Yeah, well, the same goes for blueberries. I only picked 10 pounds. . . the problem is that I actually enjoy it. The next day . . . not so much. *sigh* I’m not 22 anymore, I guess. But on the bright side – one of our local liquor stores is still running their 3 for $8 sale on wine – which is absolutely perfect to keep us in sangria for the rest of the summer! 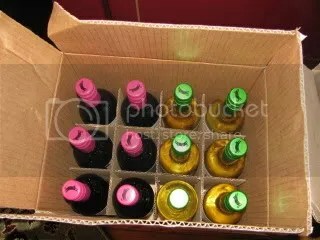 We still haven’t decided whether we prefer white or red sangria, though – so I bought 6 of one and half a dozen of the other. You know what’s coming into season? 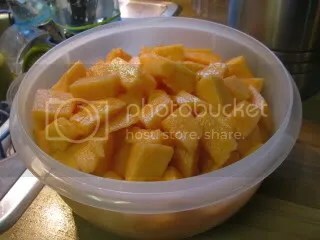 I love melon – and Saturday, I went to the market, and I smelled that tell-tale smell – the scent of ripe cantaloupe. I wasn’t prepared to make cantaloupe gelato (or whatever it is), but that won’t stop me from enjoying the ripe, juicy melon on its own! 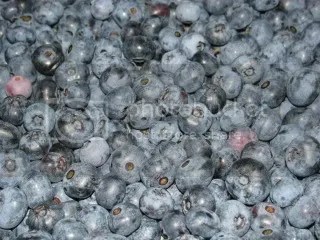 Did I mention I picked blueberries this weekend? And that I filled three sheet trays, ran out of room in the freezer, and still have a quart left? Yeah. 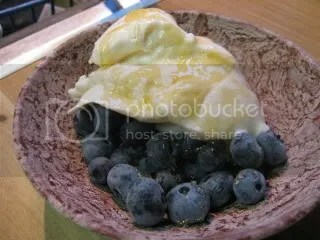 But you know, a bunch of blueberries, a bit of vanilla yogurt, and a drizzle of honey – NOT a bad breakfast, let me tell you! Oh, and besides the beautiful GIANT melon? The corn guy was at the market this weekend, too. This is a farmer who, on Saturday mornings, fills the bed of his pickup truck with fresh corn, hauls it to the market, and sells it for 15 for $3. I explained to him who “the baby” is – and he laughed! 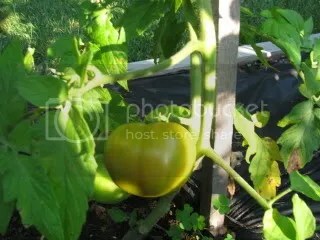 I have a tomato starting to ripen! It’s almost . . . orange-ish! Stay tuned for updates! And, um, speaking of ripening. 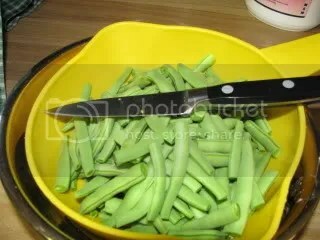 I went out to the garden the other day to pick some green beans for dinner. 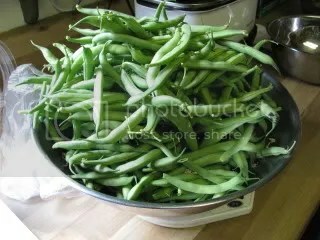 Between the hot days and the soaking rains – it’s evidently been PERFECT weather for beans – I picked 4 pounds of green beans! Now, mind you, I have a single row of beans, and it’s only 6 feet long. It’s crazy, isn’t it? And it’s just a good thing we like fresh beans, huh? And once again, it’s time for the weekly menu plan. Wow, I still can’t believe how the summer has flown by! Not only that, but we’ve done a pretty poor job of clearing out the freezer, so we’ve declared a moratorium on buying any more anything to go in the freezer – with the exception of in-season fruit and veggies, and that in moderation. (The emphasis is mostly for my sake.) So we’re looking forward to figuring out what do with what we’ve got. 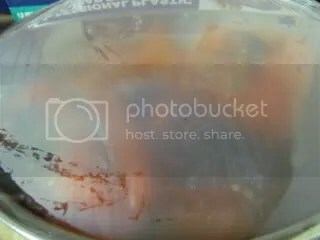 Monday – We stocked up on various single-serving fishes when they were on sale for $1 per serving. Salmon with Lentils and Mustard-Herb Butter will use up a couple of salmon fillets, along with some of the French green lentils we picked up a while ago. Round it out with a nice tossed salad, and we’ll be all set. Tuesday – I picked up a boneless leg of lamb a while ago, and we divided it into a few lamb steaks and several packets for grinding – this week, we’ll thaw some of the steaks out and try lamb with peach-ginger chutney – lamb works with fruit, right? Also, I picked up some broccoli at the market, and some steamed rice will just round it all out. Wednesday – Peeps suggested meatball sandwiches for this week, which sounded like a FINE idea! In addition, we found a recipe in this month’s Food & Wine for oven fries with herbs & Pecorino – which just seems like it’ll be perfect together, don’t you think? Thursday – We’re going to try some simply marinated chicken only, instead of the Greek influence, we’ve got some lime and a TON of out-of-control tarragon. Since the green beans are close to out-of-control, we’ll be enjoying some more of those, along with some baby potatoes, possibly all tossed with any mustard-herb butter left from Monday. Friday – And it’s pizza night! 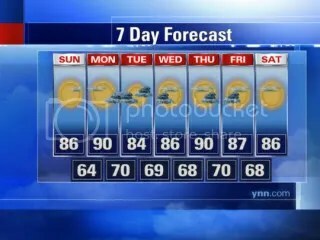 You know, it’s really nice to have one night a week we don’t actually have to think about . . .